HARRISBURG, Pa. — A lawmaker in Pennsylvania who is also a pastor’s wife is being criticized for repeatedly praying in the name of Jesus prior to the swearing in of an Islamic legislator, while a Quran reading presented the following day by a Muslim lawmaker received applause in the legislative chambers. 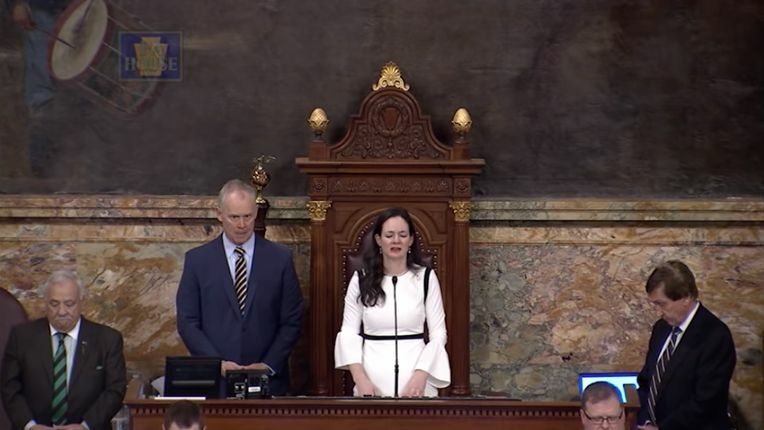 Rep. Stephanie Borowicz, R-Clinton County, provided the day’s invocation on Monday, declaring the name of Jesus and Scripture numerous times. Borowicz thanked God that the nation’s founders, such as George Washington and Abraham Lincoln, sought after God in their leadership capacities. The pastor’s wife also prayed for Pennsylvania’s political leadership, as well as President Trump. Borowicz’s husband, Jason Borowicz, serves as an associate pastor at Crossroads Community Church in Jersey Shore. According to reports, someone in the chamber called out “objection” near the end of her prayer. Borowicz soon drew criticism in light of the fact that her prayer, being so boldly Christian, preceded the swearing in of State Rep. Movita Johnson-Harrell, D- Philadelphia, a longtime Muslim. Johnson-Harrell had a number of friends and family members, who are also Muslim, present to observe her taking the oath of office. Pennsylvania Gov. Tom Wolf, who identifies as Methodist, said that he was “horrified” by Borowicz’s prayer. “I grew up in Pennsylvania. Pennsylvania was founded by William Penn on the basis of freedom of conscience. I have a strong spiritual sense. This is not a reflection of the religion I grew up in,” he stated, according to USA Today. Other lawmakers spoke out against the Republican representative’s prayer in the name of Jesus, and Johnson-Harrell soon suggested that Borowicz should be censured over the matter. On Tuesday, Muslim Rep. Jason Dawkins, D-Philadelphia, presented a reading from the Quran. He provided a brief introduction beforehand, explaining his view that beliefs are more than just words. His remarks were met with applause in the chambers. View the video of Dawkins’ remarks here.